More than a century since his conception, Sherlock Holmes remains the epitome of the private detective. In this remarkable collection are all the 60 stories – 56 short stories and four longer novels – which relate the work and skill of the legendary Holmes. In a remarkable tour de force, David Timson reads them all: this is arguably one of the greatest voice achievements in recorded history. Each story is presented with classical music, making this special 60-CD set one of the most collectable audiobooks ever released. It also comes with a booklet containing comprehensive notes on the background and content of each story. And there is even a new Sherlock Holmes story, specially written by David Timson. Sir Arthur Conan Doyle has been given a fitting tribute in The Complete Sherlock Holmes, 150 years after his birth. I’ve enjoyed David Timson’s spirited readings of the stories ever since The Speckled Band appeared in 1999. 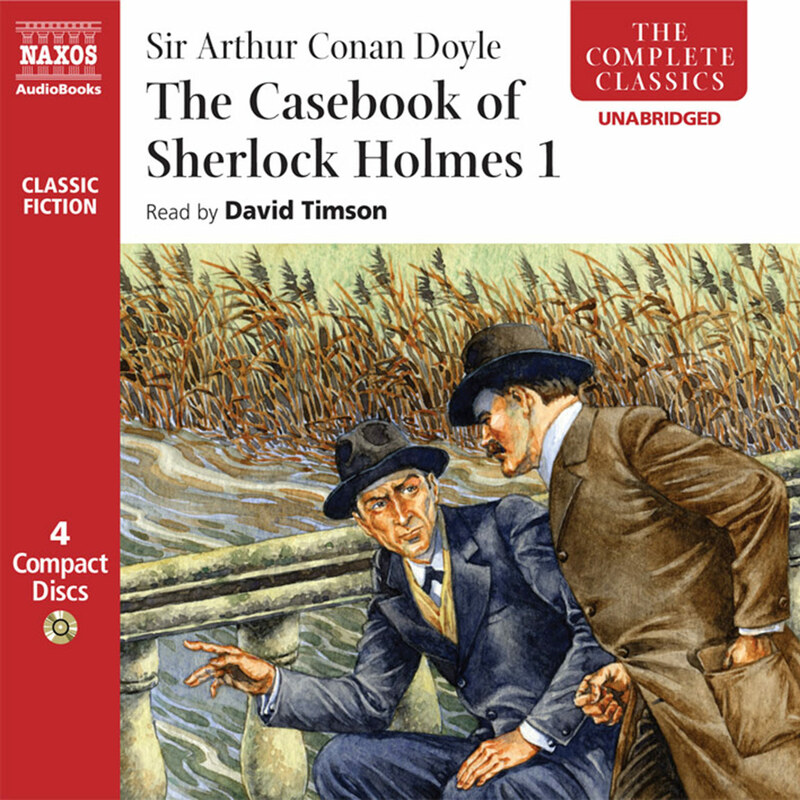 He is one of those narrators who sinks himself so convincingly into character, so subtly differentiating timbre, dialect and accent, that you can hardly believe that the reading is being done by a cast of one – this requires extraordinary versatility given the 228 disguises in the four novels and 56 stories starring Holmes that Conan Doyle penned. Timson told me that he elected to go back to the original Strand Magazine version of the tales, warts and all. Conan Doyle never proofread his work, believing that the sweeping energy of the telling was more important than accuracy of detail: “What matter if I can hold my readers?” he said. Hold them he and Timson certainly do. David Timson must have had difficulty returning to his real self after this recording tour de force – every nuance in his voice is Holmes. All 56 stories and four novels are here: 60 CDs with a chunky booklet. Years of top listening. Who knows how the art of fictional detection might have fared had a certain military surgeon attached to the 5th Northumberland Fusiliers in the second Afghan war not run into a former colleague from Barts hospital one day in Piccadilly circa 1880. Dr John H Watson had been invalided out of the army on a pension of 11s 6d a day and was now, he told his old acquaintance, searching for somewhere to live. How strange, said Dr Stamford, Watson was the second person he’d met that day looking for lodgings, or at least someone to share his comfortable rooms at 221b Baker Street. After lunch they’d take a hansom to the hospital and he’d introduce him to a Mr Sherlock Holmes, who would almost certainly be conducting some outlandish scientific experiment, such as beating corpses with a stick in the dissection room to verify how far bruises may be produced after death. You know the rest. Actually, you don’t – probably not even the half of it. This is the first time the entire Holmes canon – four novels, umpteen adventures and scores of stories with such titles as “The Adventure of the Engineer’s Thumb” and “The Man With the Twisted Lip” – has been published in a single package. Here’s where I eat my hat and confess that, far from being lukewarm as I’ve claimed more than once about the legendary sleuth, I am now as addicted to the delights of elementary deduction as Holmes was to opium. What prompted the U-turn? It’s hard to pinpoint. The unhurried build-up of the Holmes/Watson buddy relationship, maybe, described so endearingly by the latter, those fireside evenings with the doctor deep in a surgical treatise while his flatmate deciphers the inscriptions on a 15th-century palimpsest with a magnifying glass. Then there’s Holmes’s unpredictable character: Stamford thinks he’s cold-blooded, but Watson has heard him play the violin. He has published learned papers on ciphers, cigar ash, bicycle tyre impressions, chemistry; but has never heard of Carlyle. He can be bumptious, charming, cruel, but he’s never boring. And finally there’s David Timson’s wonderful voice, bringing Conan Doyle’s vast and extraordinary cast from every level of Victorian society to life. What a marathon, what a result. You might say that David Timson is to Sherlock Holmes audio what Jeremy Brett was to Sherlock TV – except the actor who embodied the legendary detective so memorably (and melancholically) for Granada managed only 41 outings before his death in 1995. 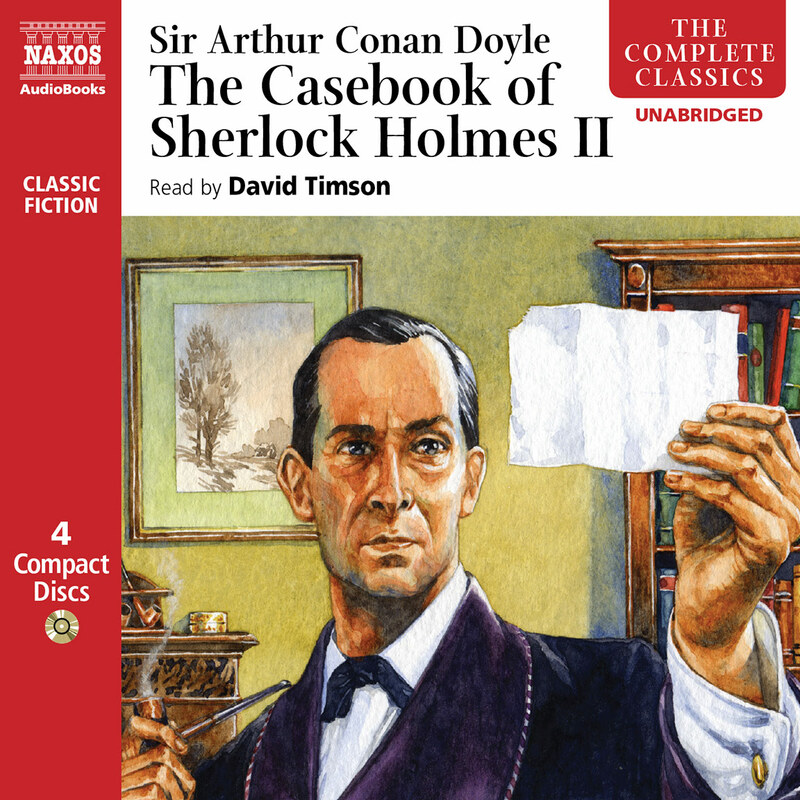 In ‘The Complete Sherlock Holmes’, a smart, unabridged box set celebrating Arthur Conan Doyle’s 150th birthday, Timson reads all 56 short stories and four novellas and even contributes one of his own. Timson’s ‘The Adventure of the Wonderful Toy’ is a fond pastiche; but it is more than that. 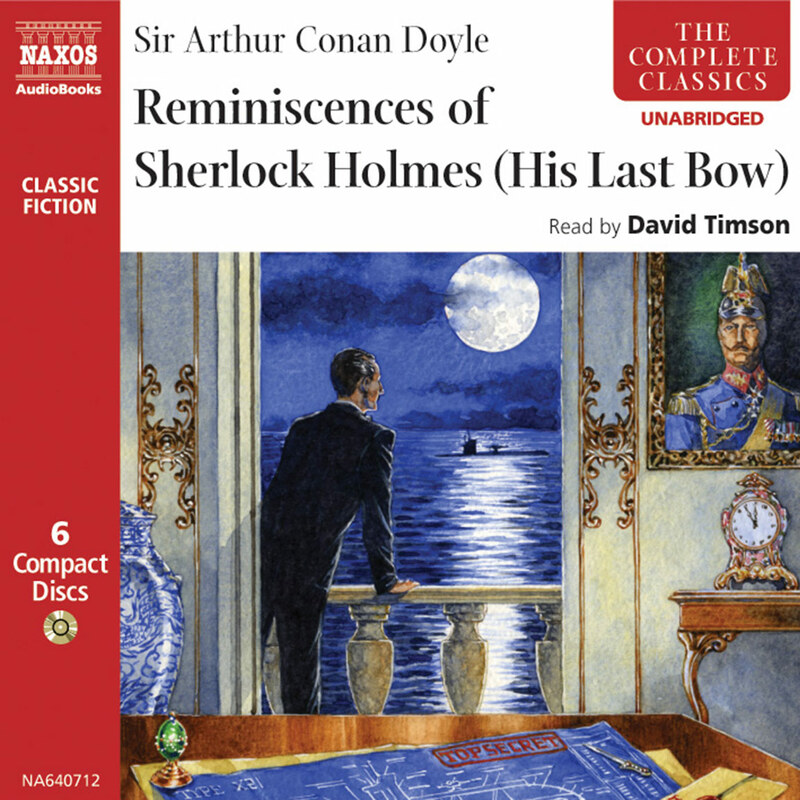 Cleverly, and rather sweetly, it offers a fictional justification for the whole audio project, as Holmes encounters that futuristic new invention, the phonograph, and a man who wants to record the detective’s reedy tones for posterity. Listening to the existing stories en masse certainly highlights some lampoonable linguistic tics (one client ‘ejaculates’ four times in a single meeting) and a few careless inconsistencies (medical papers have apparently been written about how one bullet could have caused a war wound in both Dr Watson’s shoulder and his leg). But it also confirms Conan Doyle as the greatest escapist in British literature. Ten years in the recording, this is the sort of labour of love that doesn’t usually make it out of the garden shed. Should you spot Timson in the street, please offer him a Persian slipper full of tobacco from us. I have always avoided purchasing any of David Timson’s audiobooks for Naxos, reasoning that I would rather hear a full-cast dramatisation of any story than one man reading all of them aloud. Now that Naxos has released a beautiful box set of all Timson’s recordings, I realise just how mistaken I have been. Over a period of several years, Timson has achieved a feat comparable with the BBC’s dramatisations starring Clive Merrison and Michael Williams. As far as I am aware, he is the only reader to have tackled the entire Canon. And he has proved himself equal to the task. 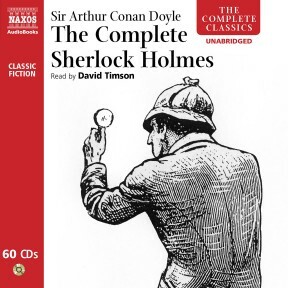 All of Conan Doyle’s stories are represented in this 60 disc-set, providing nearly 73 hours of listening pleasure – which is an entirely accurate description of the set’s contents. 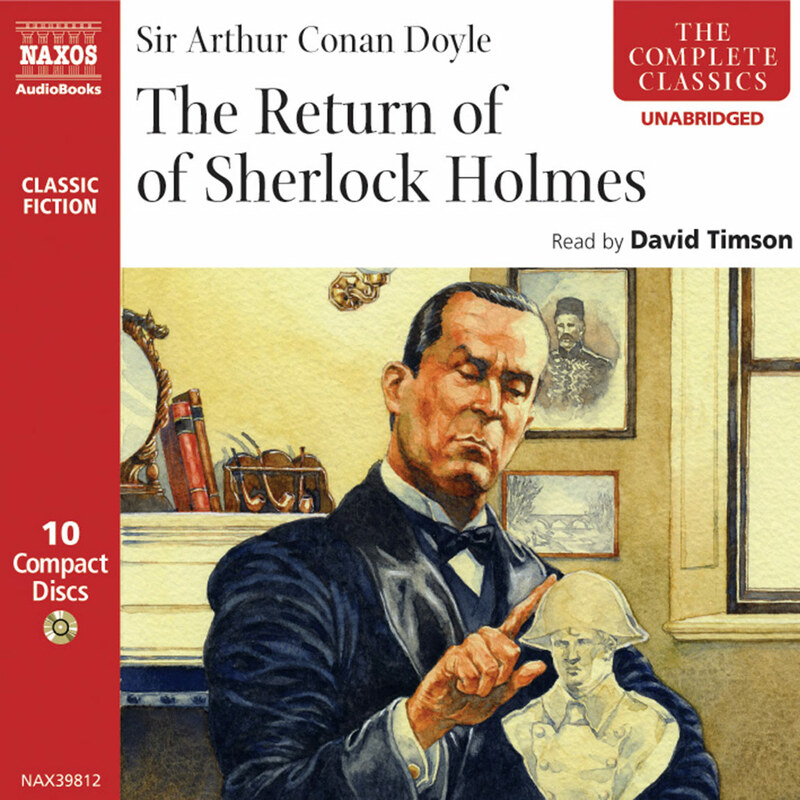 I’m happy to report that Timson’s work is among the best currently available, not simply of Holmes readings, but of audiobooks in general. His unfussy delivery puts the stories first – and while this may seem like a redundant observation, consider how our appreciation or otherwise of the Canon has been coloured by over a century’s-worth of literary criticism, much of it bloody-mindedly determined to strip away the sheer fun of the Adventures of Sherlock Holmes through an unhealthy and unhelpful obsession with dates, weather reports and the legibility of Watson’s handwriting. Timson has no hidden agenda: he is content to give us the stories as they were meant to be enjoyed, and we can bask in the elegant simplicity of Conan Doyle’s effortless prose, which has dated hardly at all in the last hundred and twenty years. As a performer, Timson is remarkably free of ego. He’s not out to show off his undoubted abilities by giving every character an outlandish accent or over-ripe delivery (although his sharp, incisive Holmes puts me in mind of Robert Hardy, who played the Master in a series of albums recorded in the early 1970s). Nor, as is the case with far too many audiobooks on the market nowadays, is he simply a disinterested reader, relaying each line with the minimum interest and enthusiasm possible. 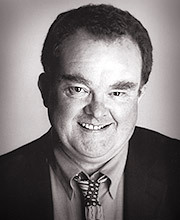 David Timson may not be a household name – in fact, I was surprised to discover that he played Horace Blatt in the Poirot episode Evil Under the Sun – but his relative anonymity is a blessing rather than a hindrance, since we are not distracted by considerations of how “so-and-so” tackles the Canon. The Canon itself is, quite rightly, the star. As an additional treat, the final disc contains Timson’s own tale, The Adventure of the Wonderful Toy. Having delivered every word of every tale, he is in an excellent position to know what makes a good Sherlock Holmes story. 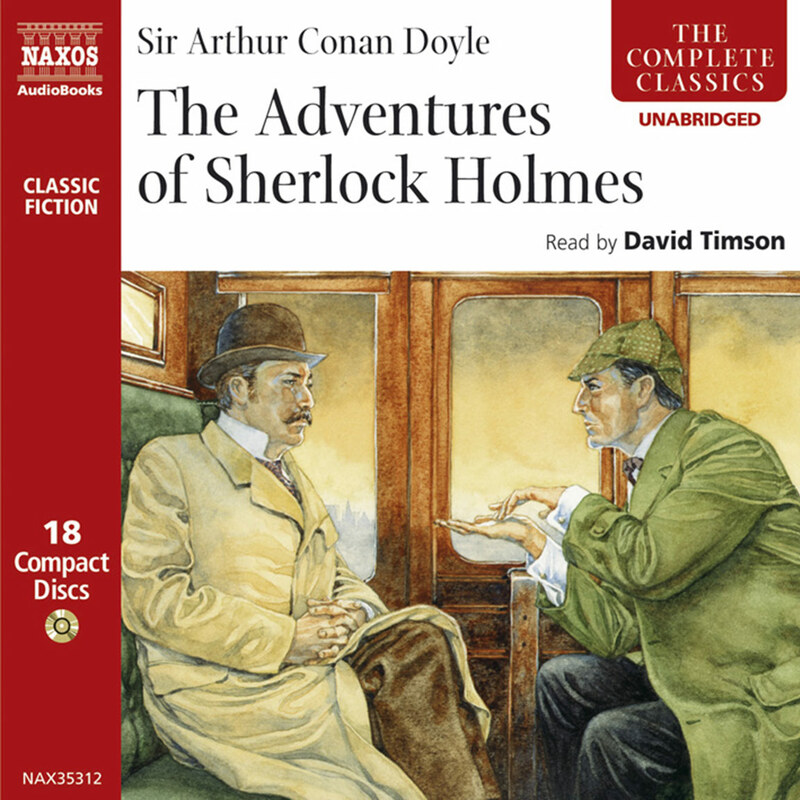 In the accompanying 200-page booklet, the he modestly suggests that the story might be treated as a parody, but he is hardly being fair on himself: this is a perfectly legitimate pastiche, with a highly appropriate theme – that of the recording of famous voices, Holmes’s included. Any quibbles concerning the set are minor indeed, but given that this is a complete collection of Holmes tales, it might have been nice to see the Apocrypha represented – at the very least, The Field Bazaar and How Watson Learned the Trick. Also, the CDs appear in the box set in the order they were originally released, rather than in publication order. But considering the difficulty of finding the story of one’s choice in W.S. Baring-Gould’s annotated collection, this is the mildest of inconveniences, and certainly not one that should dissuade you from making this the centrepiece of your audio collection.